Blair is one of the top skaters of her time, and one of the most decorated athletes in Olympic history. 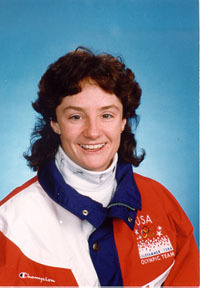 Blair competed for the United States in four Olympics, and in her Olympic career won one bronze five gold medals. Blair was born in New York but was raised in Champaign where she attended Jefferson Middle School and Centennial High School. After graduation she moved to the Milwaukee area to train with the US national speed skating team. More information on Bonnie Blair can be found on Wikipedia.